Naughty Chile Taqueria announced the opening of its first restaurant in Colorado. Adding to its 40+ taquerias nationwide, this location at 4001 Colorado Blvd. is inside the Colorado Fast Break convenience store. The new Naughty Chile introduces its updated brand and decor, and showcases its full-scale restaurant concept complete with seating and catering. The restaurant’s grand opening celebration on February 22 from 10 to 2 will feature menu item samples and swag prize giveaways. Naughty Chile also will offer a free street taco during taqueria hours to public school teachers, law enforcement and military who show an I.D. The expansion of Naughty Chile Taqueria comes at a time when the Mexican restaurant industry dominates the country’s culinary scene. As of 2018 the US houses more than 62,000 Mexican restaurants, and the Mexican menu type edged out pizza to become the 2nd most popular in the country. Pynergy’s Fast Break is the first to license the Naughty Chile concept in Colorado. Founded by Colorado native Darrell Jackson, the company owns several retail outlets across the state. 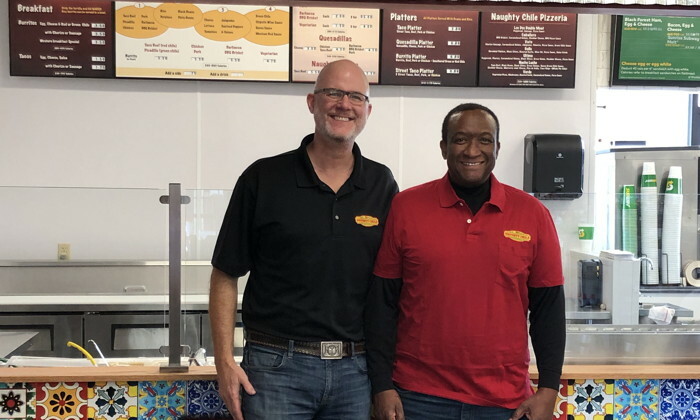 Founded in 2014 and headquartered in Denver, Colorado, Naughty Chile Taqueria is a licensed Mexican food concept scalable to any size non-traditional retail location. With a low labor model and easy to execute operations, Naughty Chile’s three daypart menu features authentic street tacos, burritos, bowls, quesadillas and nachos prepared with proprietary recipes using fresh, quality ingredients.